Here are two people I must meet the next time I'm in the UK. Sylvia Strange and Jean Grange of Leominster portray Queen Victoria and lady-in-waiting Charlotte Ponsonby, respectively, at events all over the country. Together they form Strange & Grange Presentations. They create unscripted interactions with audiences that educate and entertain; it is history presented, according to their website, "with panache, humour and just a pinch of artistic licence." They have performed in a variety of indoor and outdoor locations and have appeared in character at the Players Theatre, London; at the Upminster Tithe Barn Museum of Nostalgia; at Weston Park, Staffordshire; at the Dickens Festival, Rochester; at the Courtyard Theatre, Hereford; at Manchester City Hall, Manchester; at Osborne House, Isle of Wight; and at a dozen English Heritage sites. They have arrived in horse-drawn vehicles, steam trains, and private planes. By the way, if you care to contact the queen, her e-mail address and mobile number are provided at the Strange & Grange website. "Sylvia’s ‘Royal’ Image Has an Inspiring Effect"
Sylvia Strange sometimes has an unsettling effect on people when she dresses up as Queen Victoria. Hearing the rustle of a crinoline, a member of staff tidying a fireplace at Osborne House, Victoria's much-loved summer residence on the Isle of Wight, turned and shrieked at the sight of the royal "ghost." "The woman was quite overcome - Sylvia just said 'carry on' as we passed," said Jean Grange, who partners "Her Majesty" as lady-in-waiting Lady Charlotte Ponsonby. "Sylvia actually looks like Victoria and gets so immersed in the role that people really feel they have met royalty after meeting her." The Leominster "royals" were invited to take part in an event at Osborne House, now managed by English Heritage, where the real Victoria spent many of her long years of mourning after the death of her beloved Prince Albert. It was just one of a dazzling round of official engagements for the two enterprising grandmothers, both aged 65. Life has taken an interesting turn since they did an impromptu double-act for a Victorian event in Leominster Antique Market six years ago. They kept their stands in the market and Jean still does the books for her husband's plumbing and heating business. But they have also developed another life. They take their act to stately homes, castles, banquets, luncheon clubs, and schools and next stop is the House of Commons. At Westminster they are launching a book, 50 over 50 by Debbie Rowe and Tracey Larcombe, in which their profiles appear among those of 50 high achieving woman aged over 50. "We feel very, very honoured to have been included in the book - it is designed to stir the imagination of women who have turned 50 to show what women can achieve," said Jean. The Leominster impersonators have worked hard to build their new career, researching Victoria and her times, taking drama and singing lessons and sourcing quality costumes and reproductions of Victoria's jewellery. It takes them two hours to prepare and their costumes include authentic - and copious - Victorian underwear and corsets. 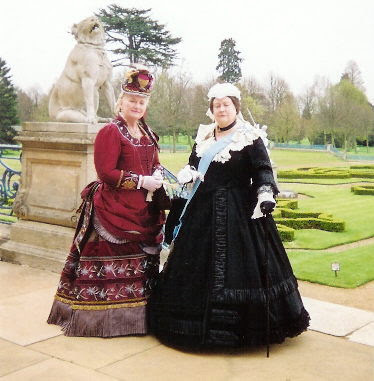 Shown here: Grange (left) as Lady Charlotte Ponsonby and Strange (right) as Queen Victoria at Wrest Park Gardens in Bedfordshire.